Here is a photograph of the adjustable mount to accurately align the power source – in this instance showing a brushless electric motor. A different view showing a conventional Graupner 900 electric motor. 1. 13″ propshaft and tube. 3 .Jeti forward/reverse speed controller for brushless motors. 4. Raboesch or Ripmax coupling. 8. Water scoop for cooling conventional motors. 9. Aluminium tube for cooling coil for conventional motors. 10. NiMH battery pack or gell cells, and Silicone wire. 11. Brushless or conventional motor. Three 6v batteries are required for the conventional motor for the 46″ Crash Tender 18v combination which gives a good performance with a 35 amp Electronize speed controller. 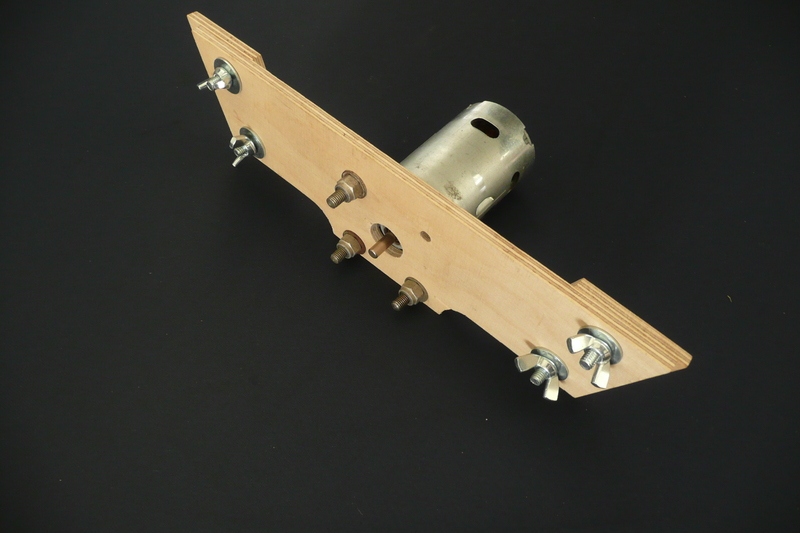 1 receiver, 2.4 GHz recommended. Speed controller for brushless or conventional motors. Motor options include traditional brushed or modern brushless setups. The brushless option is recommended as this gives better performance, higher efficiency and lighter weight. 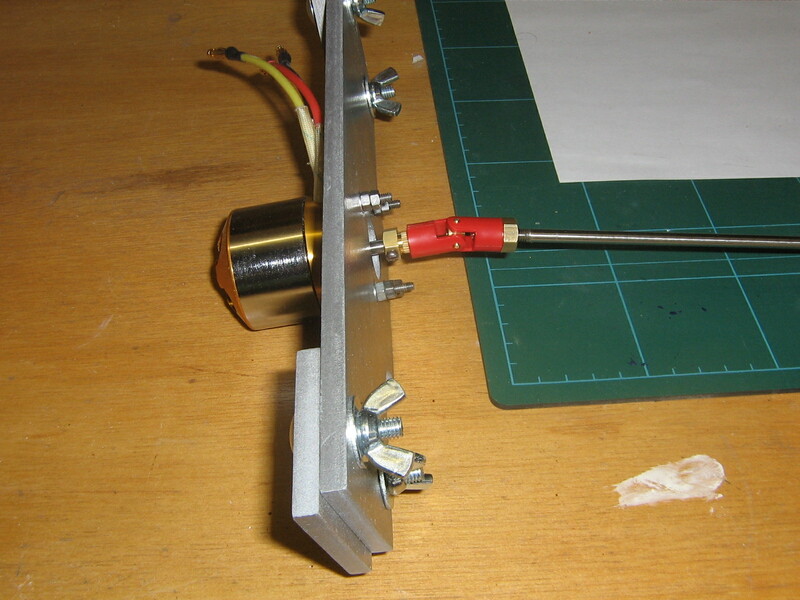 The motor should have a power capability of at least 1000W and a Kv of between 450 and 500. A motor which has proven to give excellent results is the Scorpion 4020-14. 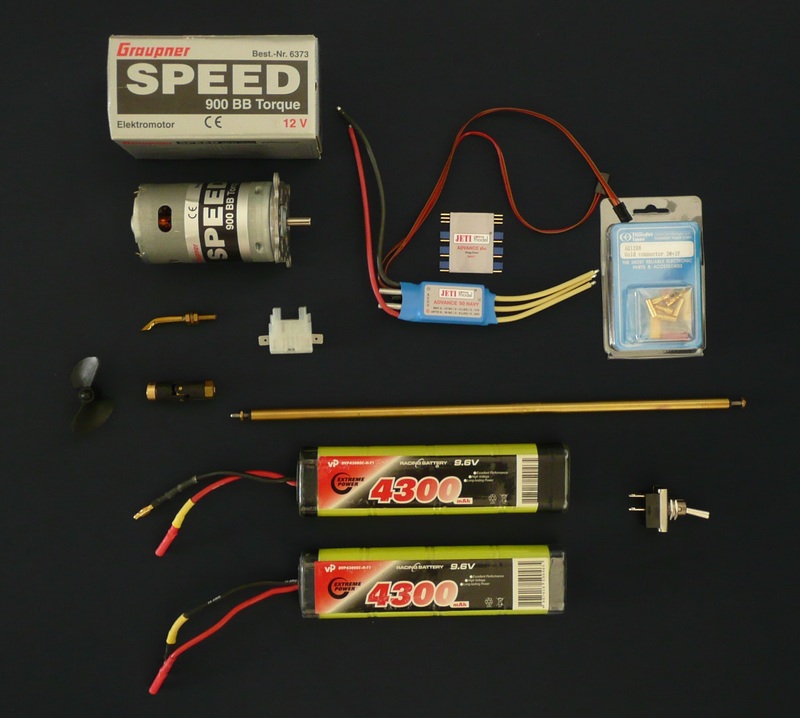 Brushless motors require special speed controllers. A water cooled brushless controller with reverse is recommended. The ESC should have a voltage rating of at least 24V and a current rating of at least 50A. An ESC which meets the requirements is the Jeti Advance 50 Navy. The batteries should provide around 20V and be able to deliver up to 30A. 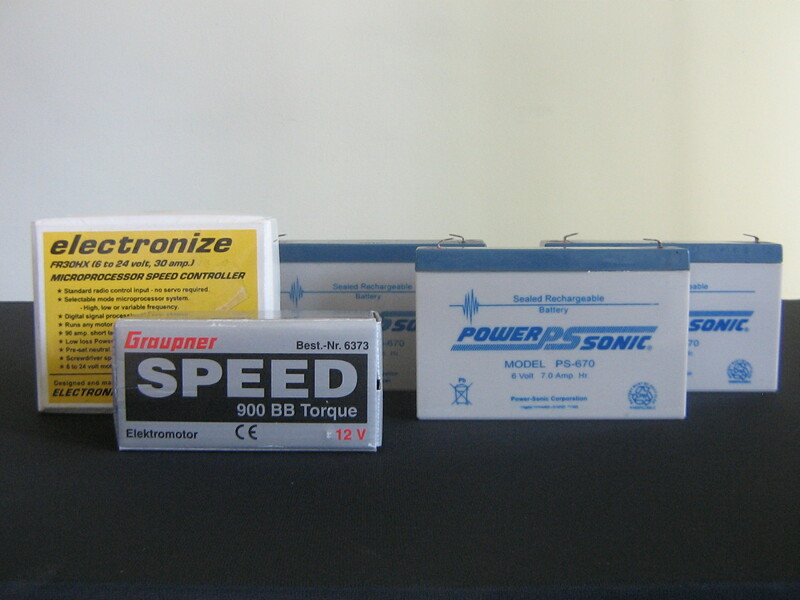 The recommended battery configuration is two 9.6V Sub C NiMh (Nickel Metal Hydride ) packs in series. These should have a capacity of at least 4600mAh. Note that 9.6V packs comprise 8 cells. A two-blade X50 plastic propeller provides the correct match to the motor/battery combination specified. The only brushed motor which has proved suitable is the Graupner Speed 900 BB Torque. The brushed speed controller should have a voltage rating of at least 24V and a current rating of at least 30A. An ESC with reverse is recommended. The Electronize FR30HX is a good match to the suggested motor/battery/prop combination. These can be the NiMh packs detailed above for the brushless configuration (recommended) or three 6V 7Ah gel cells in series. Only use a peak detecting charger with a NiMh setting. It may be necessary to charge the packs separately as many chargers cannot handle 16 cells. Only use a dedicated gel cell charger or a programmable charger with a gel cell setting. The charger should either revert to trickle charge or cut out when the battery is fully charged.